GTD: This was your 3rd summer training in Coach Braz's program. Has the program changed over the years? Sydney: Since my first season of Braz Camp as a rising sophomore, I've noticed how much I've grown as a runner and how much the camp has grown. Just by mere size, the program is much larger now than it was during my first two years. 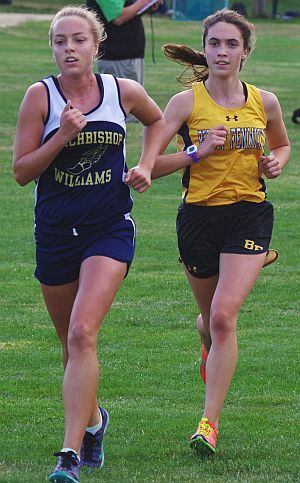 As a sophomore and junior, athletes were divided into four groups, whereas this year I was surprised to hear that there were six groups due to the size of the cross country camp. This growth changed the demeanor of camp in a positive way. There have been so many opportunities to make and keep connections with runners who quickly become friends. 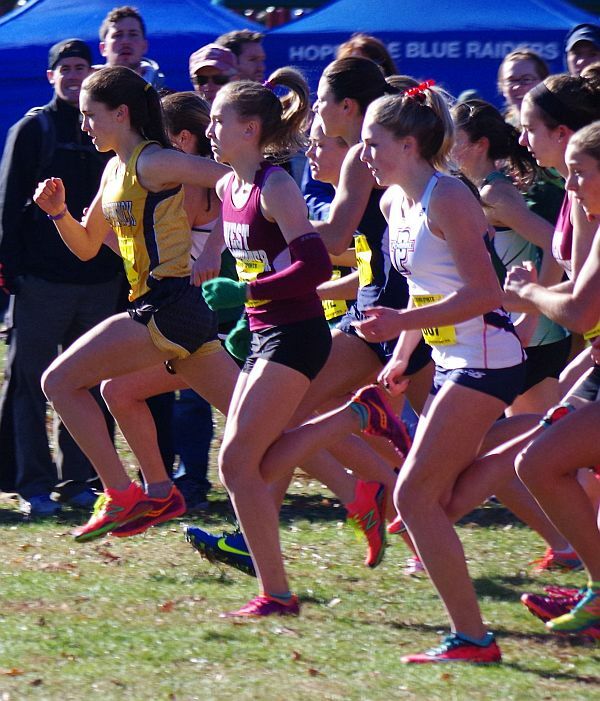 Over the years, I have been able to train with some of the most talented runners in the state and get advice from the most knowledgeable and caring coaches. Even though Coach Braz has added and altered the workouts each summer, the one central constant has been his, the coaching staff's and the athlete's commitment to hard work and personal development. From the first day I met Coach Braz, Pete, Colette, Ginny and Fred Doyle, I knew how much they cared about me as an individual, and that has helped so much with my mindset toward. Also being surrounded by a group of runners who are all devoted to improvement helped me be more focused during training. Sydney writes: "the start of All-States at Stanley Park in Westfield- I'm out front (but not for long) in the yellow!" GTD: What was different for you as you trained to compete for your senior year vs. getting ready for you sophomore and junior years? Sydney: My sophomore year was definitely an experiment with cross country, as I had never run it before- I only knew about track. I worked hard and got used to the mileage. As a junior, I was physically able to handle the mileage for cross country, but I still had a hard time with the mental aspect. I convinced myself that I was a mid-distance runner (as my main track event is the 800m). My times from the previous year improved, but they weren't close to my goals. Finally senior year, both Coach Braz and my Bishop Fenwick Coach, Coach Czarnecki, helped me match my physical strength with mental strength. The last day of Braz camp, Coach Braz talked to me about how to be mentally strong by saving my mental energy for the big meets (Divisionals and All-States). I should use the regular season meets as preparation for these meets. I kept this with me the entire season, working through unsatisfying times until I got to states. At the division 6 meet, I felt confident and ready. I ended up running what I consider my best cross country race. I reached my three year goal of breaking 20 minutes in a 5k and ran a 55 second personal record. Coach Czarnecki told me I came into the season in "collegiate shape" and I think this is because of all the preparation, both mentally and physically, I had over the summer. Sydney: A huge player in what helped be in "collegiate shape" was the core work, flexibility work, strength training and plyometrics. At the end of an exhausting hill workout or tempo run, core and strength work are much more challenging. While the additional activities were painful and I do admit to complaining during the workouts, I am so glad they were incorporated. Not only did they make me a more balanced and physically stronger runner, they also helped me be more mentally tough. During the cross country season, I tried to keep all the summer exercises in mind and incorporate them into my workouts. GTD: What are your winter plans for running? Sydney: For the winter I hope to run in meets offering the 800m, try to run a fast time, and hopefully qualify for New Balance Nationals. For the regular season, my coach and I are going to experiment with the 600m and 1000m, to see which would be better to compete in for states. Right now our team looks very strong and I hope we can earn a league title for a third year. Sydney: Right now I my heart is set on pursuing chemical engineering and running in college. I have applied to WPI, RPI, Umass Lowell and UNH. I would prefer to run at a Division 3 school because chemical engineering is such a demanding major and also because I would have more opportunities to compete at high level meets.